What's your clutter actually covering up? Once you're aware of the real issue, letting go is simple and decluttering can happen immediately. Using step-by-step instructions and easy-to-understand explanations, Tisha Morris shows you how to move into a new phase of life by ridding yourself of all that's holding you back. Everything in your home is an extension of your identity, and when you keep old stuff for too long, you get stuck in the past. 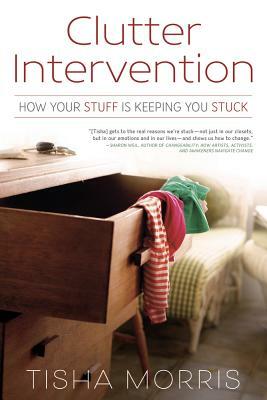 Clutter Intervention teaches you about the psychological, emotional, and energetic components underlying your possessions, making it easier for you to let go and live authentically. Discover ways to clear out items associated with your past relationships, jobs, and unhealed grief. Learn how to handle blind spots, common excuses, and overcompensation. This book isn't about living with less. It's about living in alignment with the life you want. Tisha Morris is a feng shui consultant, interior designer, certified life coach, energy healer, and yoga instructor. She is also the author of Feng Shui Your Life (Turner Publishing, 2011). She is based in Los Angeles, California, and can be found online at TishaMorris.com.